The treatment of acute myeloid leukemia (AML) has remained relatively unchanged for the past 3–4 decades with generally poor outcomes, especially in elderly populations unfit for intensive therapy. Recent advancements, however, have identified several cytogenetic and molecular markers that have not only improved prognostication but have also led to the development of several new targeted therapies for specific subpopulations. In 2017, the US Food and Drug Administration approved four new treatments with indications for fms like tyrosine kinase 3 (FLT3)-mutated AML (midostaurin), newly diagnosed or relapsed/refractory CD33+AML (gemtuzumab ozogamicin), newly diagnosed therapy-related AML or AML with myelodysplasia-related changes (CPX-351) and relapsed/refractory AML with an isocitrate dehydrogenase (IDH)2 mutation (enasidenib). These newly approved therapies have demonstrated improved response in their target populations in several pivotal clinical trials with some also demonstrating improved overall survival. Additional novel therapies in development for AML include agents that target B cell lymphoma 2, FLT3, IDH1, the ubiquitination pathway, as well as cell therapy using engineered T cells with chimeric antigen receptors. This review provides a summary of the four newly approved therapies for AML, as well as several promising therapies currently in development. Several genetic lesions and morphological features have been identified as prognostic markers with clinical significance, and importantly, some carry predictive/actionable value (table 1). During initial diagnostic workup, European LeukemiaNet (ELN) recommends screening for mutations in NPM1, CEBPA, RUNX1, ASXL1 and FLT3 at diagnosis.8 Mutations in isocitrate dehydrogenase 2 (IDH2) are also often tested for initially, due to their newly actionable status in the relapsed or refractory (R/R) setting. Mutations in NPM1 are found in 25%–35% of patients with AML, most frequently associated with normal karyotype.1 Isolated mutations in NPM1 are associated with favorable prognosis,9 and in this population NPM1 has been used as a pilot genetic marker for assessing minimal residual disease after induction.10 Biallelic mutations in CEBPA are associated with a favorable outcome, as well as with familial AML, and are found in 6%–10% of patients. FLT3-internal tandem duplication (ITD) mutations are found in approximately 20% of patients with AML, most often associated with normal cytogenetics and are associated with an unfavorable outcome in some patients.11 Patients with a mutation in FLT3-ITD may benefit from allo-HSCT in first CR as well as from tyrosine kinase inhibitors (TKIs) that have either been approved or are in clinical trials. Despite the rapid development of prognostic and predictive molecular characteristics, history and morphological, immunophenotypic and cytogenetic evaluation at diagnosis remain crucial as there are newly approved frontline agents shown to have OS benefit with myelodysplasia-related changes or therapy-related AML and AML expressing CD33. This article aims to review the four recently approved AML therapies as well as some in advanced development, as the landscape of AML therapy has changed more in the last year than in many decades prior. Midostaurin (Rydapt, Novartis Pharmaceuticals) is a multitargeted kinase inhibitor that was the first of four novel therapies to receive food and drug administration (FDA) approval for treatment of AML in 2017. As discussed, FLT3 mutations are found in approximately 20%–30% of patients with newly diagnosed AML and are associated with a poor outcome. Most FLT3 mutations are of the ITD mutation subtype, which is associated with a high relapse rate when there is high mutant to wild-type FLT3 allelic ratio. A smaller subset of FLT3 mutations are of the tyrosine kinase domain (TKD) subtype. Midostaurin was evaluated in a large, international phase III study, the CALGB 10603/RATIFY trial (table 2). In this randomized, double-blinded, placebo-controlled study, patients younger than age 60 with newly diagnosed FLT3-mutated (both ITD and TKD) AML were randomized to standard 7+3 chemotherapy with either midostaurin or placebo.12 Patients who achieved CR following induction therapy received four cycles of consolidation therapy with high-dose cytarabine (HiDAC) and midostaurin/placebo maintenance for up to 1 year. Allo-HSCT was performed in 25% of patients who achieved first CR, although this was not mandated by study protocol. The study demonstrated that combination 7+3 chemotherapy and midostaurin led to a significant improvement in OS, with a median OS of 74.7 months in the midostaurin group versus 25.6 months (HR for death 0.78, p=0.009) with placebo. Subgroup analysis between the low allelic ratio ITD, high allelic ratio ITD and TKD groups did not show any significant difference in OS. The rate of serious adverse effects (AEs) was not significantly different between the two treatment arms, with the exception of a higher rate of grade 3 or greater rash/desquamation and nausea in the midostaurin arm. The most common AEs associated with midostaurin include nausea, vomiting, headache, fever and febrile neutropenia. As patients in this study were exposed to midostaurin for induction, consolidation and maintenance, the specific benefit and optimal duration of midostaurin maintenance are unclear. Gemtuzumab ozogamicin (Mylotarg; Pfizer) is a humanized immunoglobulin antibody directed against CD33 and conjugated with calicheamicin, a cytotoxic antibiotic. CD33 is a transmembrane receptor that is highly expressed on blasts of most patients with AML. GO promotes single-strand and double-strand breaks in DNA, ultimately leading to cell death. GO initially received accelerated FDA approval for CD33+AML in 2000 based on CR rates in non-randomized phase II studies. However, a follow-up phase III study13 in patients with untreated AML comparing standard 7+3 induction chemotherapy plus GO versus 7+3 alone found a higher mortality rate in the GO arm (5.5% vs 1.4%), without any improvement in CR. This led to the withdrawal of GO from the market in 2010. Subsequent trials, however, showed improved OS rates without increased mortality rates.14 15 The phase III randomized ALFA-0701 study investigated low fractionated-dose GO with standard first-line chemotherapy in patients with de novo AML,16 and found an improvement in median OS in the GO arm (34 months versus 19.2 months, p=0.046). In subgroup analysis, this benefit was limited to patients with favorable-risk and intermediate-risk karyotypes. Subsequent meta-analysis found that among 3325 patients in five randomized controlled trials, the addition of GO reduced the risk of relapse and improved OS at 5 years (34.6% vs 30.7%).17 Additionally, at 6 years, survival benefit was significant in patients with favorable-risk (76.3% vs 55.2%) and intermediate-risk (39.4% vs 34.1%) cytogenetics. These studies including the meta-analysis led to reapplication for FDA approval (at the lower, fractionated dosing), which was granted in September 2017 for patients with newly diagnosed CD33+AML and also for R/R CD33+AML, based on the MyloFrance-1 study18 (table 2). The most common AEs include nausea, vomiting, transaminitis (elevations in aspartate aminotransferase or alanine aminotransferase), and hemorrhage. Although GO still retains its black box warning for veno-occlusive disease, events using current approved dosing were rare (2%) and can be associated with prior alkylator chemotherapy. CPX-351 (Vyxeos; Jazz Pharmaceuticals) is a liposomal formulation of cytarabine and daunorubicin (the standard agents in 7+3 induction chemotherapy) in a fixed, synergistic 5:1 molar ratio. Prior preclinical studies had demonstrated that molar ratios of cytarabine and daunorubicin between 1:1 and 10:1 were synergistic, whereas lower ratios were antagonistic.19 Although CPX-351 is not a targeted therapy, the fixed 5:1 molar ratio and liposomal packaging demonstrated more effective delivery and cytotoxicity to AML blasts. A multicenter, randomized phase II trial compared CPX-351 with investigator’s choice of chemotherapy for patients with AML in first relapse.20 The study demonstrated an improvement in the rate of CR or CR with incomplete hematologic recovery (CRi) in the CPX-351 arm (49.4% vs 40.9%) as well as improvement in median OS in the CPX-351 arm (8.5 months vs 6.3 months). A randomized phase II trial in 2014 comparing CPX-351 to 7+3 chemotherapy in first-line treatment of AML in older patients did not demonstrate a statistically significant difference in OS between the study’s two arms; however, response rate was improved (57.6% vs 31.6%, p=0.06) in patients with secondary AML.21 This latter phase II trial led to a phase III trial comparing CPX-351 versus 7+3 chemotherapy in patients 60–75 years of age with high-risk secondary AML (untreated therapy-related AML, antecedent myelodysplastic syndrome (MDS) or chronic myelomonocytic leukemia, or AML with myelodysplasia-related changes), and confirmed superior OS (9.56 months vs 5.95 months, p=0.005) in the CPX-351 arm, as well as CR/CRi rates (47.7% vs 33.3%, p=0.016).22 Severe AEs were similar in both treatment arms. CPX-351 subsequently received FDA approval through priority review and breakthrough therapy designations for newly diagnosed therapy-related AML or AML with myelodysplasia-related changes in August 2017 (table 2). Enasidenib (Idhifa, Agios Pharmaceuticals and Celgene Corporation) is a selective inhibitor of mutated IDH2. Mutations in IDH2 occur in approximately 10% of patients with AML4 and lead to the synthesis of 2-hydroxyglutarate, which results in DNA and histone hypermethylation and impaired cellular differentiation. Enasidenib received FDA approval in August 2017 for IDH2-mutant R/R AML at a dosing of 100 mg orally once per day (table 2). In the first-in-human phase I/II study published in 2017, enasidenib at the approved dose produced CR/(CRi) in 26.6% of patients with R/R AML.23 An additional 12% of patients experienced either a partial response (PR) or achieved a morphologic leukemia-free state (MLFS) (where blasts are not increased but no recovery of any cell lineage has occurred), corresponding to an overall response rate (ORR) of 38.5%. Median time to best response was 3.7 months. Median OS was 9.3 months (95% CI 8.2 to 10.9 months) overall, with a median OS of 19.7 months in patients who achieved CR. Of note, individuals with clinical responses did not have a reduction in IDH2 mutant allele burden, reflecting a shift from undifferentiated to differentiated clonal hematopoiesis. The most common AEs from enasidenib included nausea and indirect hyperbilirubinemia. Hyperleukocytosis secondary to en masse differentiation was also seen infrequently (<4%) and was managed with hydroxyurea. The most distinct AE was IDH-inhibitor-associated differentiation syndrome (IDH-DS), which occurred in approximately 10% of patients in this study. IDH-DS typically occurred within 3–4 months of treatment initiation and did not have a pathognomonic sign or symptom. IDH-DS typically presented with new or worsening dyspnea or hypoxemia, new or worsening pulmonary infiltrates on radiographs, new or worsening peripheral edema, and worsening renal function.24 As there is no available confirmatory laboratory testing for IDH-DS, careful clinical evaluation for suspected IDH-HS is warranted. Based off the study authors’ experience, recommended treatment for IDH-DS is corticosteroids (eg, dexamethasone 10 mg every 12 hours) started immediately and to briefly hold enasidenib until there is improvement in symptoms. Several novel anti-AML agents are in various stages of development. Examples are highlighted in table 3 and described in the following sections. Venetoclax is an oral targeted small molecule that inhibits BCL2, an important antiapoptotic protein expressed in AML.25 Venetoclax was approved in April 2016 for use in chronic lymphocytic lymphoma (CLL) with a 17p deletion after one prior therapy and is undergoing clinical trial evaluation in many other hematologic neoplasms, including AML. Initial activity was modest (ORR 19%) as monotherapy in a non-randomized phase II trial in R/R AML,26 but a subsequent non-randomized phase II study combining venetoclax with hypomethylating agents azacitidine or decitabine in the upfront elderly population unfit for intensive chemotherapy showed an ORR of 67%. Primary AEs were cytopenias, as is seen in CLL. Only 5 of 145 patients died within 1 month of starting drug.27 Based on these results and other phase II trials,28 29 two phase III randomized clinical trials are under way in adults with AML ineligible for standard induction chemotherapy, one (NCT02993523) evaluating venetoclax with azacitidine versus azacitidine alone, the other (NCT03069352) studying venetoclax with low-dose cytarabine (LDAC) versus LDAC alone. These combinations may offer this population much more efficacious options, considering traditionally poor overall outcomes. Quizartinib is a more selective and potent TKI that inhibits FLT3-wild type and FLT3-ITD activity, but not FLT3-TKD.33 An open-label phase II trial evaluated quizartinib monotherapy in two cohorts of patients with FTL3-ITD positive or negative R/R AML after second-line chemotherapy or allo-HSCT.34 35 The majority of the patients in both cohorts were FLT3-ITD positive. The two cohorts demonstrated promising efficacy of single-agent quizartinib with a composite CR rate (CRc, defined as the combination of CR, CR with incomplete platelet recovery and CRi) of 44%–50% in R/R FLT3-ITD positive AML. Common AEs of quizartinib include myelosupression, QT prolongation, nausea, and diarrhea. Two phase III trials are currently investigating quizartinib, QuANTUM-First (NCT02668653) which compares standard induction chemotherapy in addition to quizartinib or placebo in newly diagnosed patients with FTL3-ITD AML, and QuANTUM-R (NCT02039726), studying single-agent quizartinib versus salvage chemotherapy in R/R FTL3-ITD positive AML. Gilteritinib, an inhibitor of both FLT3 and related kinase AXL, has shown promising response data in early phase trials and is now being studied in four phase III trials. In the first-in-human phase I/II study, 252 patients with R/R AML were enrolled, 25% had received prior TKI and 63% had FLT3 mutations. Diarrhea (16%) and fatigue (15%) were the most common treatment-related AEs. ORR was 12% in FLT3-wild-type patients, but was 52% in FLT3-mutated patients receiving ≥80 mg. This enriched group had a median OS of 31 weeks and median duration of response of 20 weeks.36 Current phase III trials include the ADMIRAL study (NCT02421939) in FLT3-mutated R/R AML compared with salvage chemotherapy. Gilteritinib is also being evaluated in the maintenance setting for FLT3-ITD-mutated patients after allo-HSCT compared with placebo (NCT02997202) and also in those patients not proceeding with transplant (NCT02927262). In addition, it is being studied in newly diagnosed patients with a FLT3 mutation not eligible for intensive induction chemotherapy in a three-arm study, comparing azacitidine alone, gilteritinib alone, and combination azacitidine and gilteritinib (NCT02752035). Crenolanib is another second-generation FLT3 inhibitor which has activity in preclinical studies including against resistance mutations that develop with other FLT3 inhibitor therapy.37 In a single-center open-label phase II study of R/R patients with AML with either FLT3-ITD or FLT3-TKD mutations, crenolanib was studied as a single agent. Out of 34 evaluable patients, 13 were FLT3 TKI-naive, and 21 had progressed on prior FLT3-TKI, and 10 had progressed after Allo-SCT. ORR was 47%, with 23% of the TKI-naive cohort achieving CRi (5% in the prior TKI cohort). The primary toxicities were abdominal pain and nausea, with no deaths attributed to therapy.38 Preliminary data from a phase II trial (NCT02283177) evaluating crenolanib with 7+3 induction and consolidation in newly diagnosed FLT3-mutated patients, similar to midostaurin’s approved indication, was presented at the ASH 2017 annual meeting. Out of 29 patients, 21 (72%) achieved CR after one induction cycle, three more achieved CR with second induction, high-dose cytarabine, and allo-HSCT. At a median follow-up of 14 months, one patient out of the 24 achieving CR died of post-transplant complications, and only two relapsed.39 Crenolanib is now being studied in two randomized phase III studies, one comparing directly to midostaurin in the newly diagnosed setting with induction chemotherapy (NCT03258931), and the other in the R/R setting combined with salvage chemotherapy (NCT03250338). IDH1 is mutated in approximately 9%–16% of patients with AML who are most often cytogenetically normal. IDH1 mutations have thus far found to be mutually exclusive with IDH2 mutations.40 41 Ivosidenib (AG120, Agios Pharmaceuticals) is a novel IDH1 inhibitor in development and has been studied in a phase I trial presented at the 2017 ASH annual meeting.42 In this first-in-human safety study in mutant IDH1 advanced hematologic malignancies including R/R AML, 258 patients received ivosidenib including dose escalation (78 patients) and dose expansion (180 patients) phases. The highest frequency AEs were diarrhea (33%), leukocytosis (30%), nausea (30%), fatigue (29%), febrile neutropenia (25%), dyspnea (24%), anemia (23%), and QT prolongation (23%), most of these being low grade and unrelated to therapy. DS, as seen with IDH2 inhibitor enasidenib, was seen in 29 patients (11.2%), but no deaths occurred due to DS. Regarding efficacy, ORR was 41.6%, including 21.6% achieving CR and 8.8% with CR with partial hematologic recovery (CRh). Median duration of CR+CRh was 8.2 months. Ivosidenib is currently being studied in a global randomized phase III trial (NCT03173248) in untreated IDH1-mutated AML combined with azacitidine or placebo. Further understanding of AML biology has revealed defects in the ubiquitination/protein degradation system including a process called neddylation, essential for some ubiquitin ligases and subsequent degradation of their substrates.43 44 Pevonidostat is a first-in-class inhibitor of the neural precursor cell expressed, developmentally downregulated 8 (NEDD8) activating enzyme that works by causing accumulation of otherwise-degraded proteins with antiproliferative effects.45 After preclinical experiments demonstrated increased reactive oxygen species and apoptosis in AML cell lines and animal models when combined with azacitidine,46 47 pevonidostat was studied in phase I clinical trials, first in a monotherapy safety study which observed a few CR and PR in a heavily pretreated population48 and then in a phase Ib study in combination with azacitidine in older patients with AML who had not received cytotoxic chemotherapy.49 Here, dose-limiting toxicities were elevated bilirubin and transaminases but were reversible without clinical sequelae. The ORR in combination with azacitidine was 60% with a CR/CRi rate of 47% that was not influenced by disease status (de novo vs secondary), blast count or cytogenetic risk. After a median follow-up of 16.4 months, median OS was 7 months and 12-month survival was 45%. Based on these results, a randomized phase III study of pevonedistat and azacitidine versus azacitidine for patients with treatment naive higher risk MDS, chronic myelomonocytic leukemia and low blast count AML (up to 30% blasts) is ongoing (NCT03268954). Novel cell therapies using engineered T cells with chimeric antigen receptors (CAR-T cells) are now approved for B cell acute lymphoblastic lymphoma (B-ALL) and R/R large B cell lymphoma. In AML, preclinical studies have used targets such as CD33 and CD123 with efficacy in vitro,50 51 but the heterogeneous nature of AML makes specificity and on-target, off-tumor effects an issue in vivo. Wang et al reported treatment of a single patient with refractory AML with CD33-directed CAR-T cell therapy, without any conditioning chemotherapy.52 Within 2 weeks, the patient’s bone marrow blast percentage decreased from >50% before infusion to <6%. AEs included cytokine-release syndrome (CRS) and worsened cytopenias. Etanercept, an anti-TNF-alpha agent, was administered for anti-inflammatory effects. Unfortunately, despite initial clinical response, blast percentage rose to 70% at 9 weeks with retention of CD33 expression, suggesting an escape mechanism other than CAR target loss. Two phase I studies in China in R/R AML are currently ongoing, with the first studying autologous CD33-directed CAR-Ts (NCT01864902), and the second study using allogeneic CAR-T therapy (NCT02799680). CD123 is another promising target in AML, as it is expressed on AML blasts and leukemic stem cells, but minimally on hematopoietic stem cells.53 Several other phase I CAR-T trials are currently accruing patients using CD123, CD123/CD28 or CD123/CD33 combinations, among other targets. Overall, major challenges remain regarding elucidation of the best targets or combinations of, CRS, and costimulatory molecules that improve efficacy while balancing toxic off-tumor effects. The ideal preparative regimens are also yet to be defined. Flotetuzumab is a dual-affinity retargeting antibody, which engages both CD123-expressing AML cells and T cells via CD3. The dual-targeting antibody-based approach is similar in principle to bispecific T cell engagers such as blinatumomab, which is currently approved for B-ALL. Preliminary data from a phase I study using flotetuzumab in R/R AML and high-risk MDS was reported at ASH 2017.54 Forty-five patients were enrolled, of which 89% had AML. A lower lead-in dose of flotetuzumab was given for the first week to help mitigate CRS. Drug-related grade 3 or worse AEs were experienced in 44% of patients, the most common toxicity being CRS/infusion-related reaction in 76% of all patients (any grade). Fourteen patients were treated with the maximum tolerated dose and schedule or greater and completed at least one cycle. Six of these (43%) had an objective response (three CR, one CRi, one MLFS, one PR), two more had stable disease, and correlative studies showed an increase in T cell activating cytokine levels and CD8-positive T cells in the bone marrow. In summary, 2017 has been a pivotal year for AML clinicians, researchers, and patients. As understanding of AML biology improves, particularly, its molecular underpinnings; novel prognostic and targetable subpopulations are being defined (figure 1). The four newly approved therapies have changed the standard of care for their respective populations. For those newly diagnosed, fit for intensive therapy and with favorable and intermediate risk cytogenetic and molecular features, the addition of GO improves OS when added to 7+3 chemotherapy. For fit patients with a FLT3 mutation, midostaurin significantly improves median OS when added to induction chemotherapy. In newly diagnosed, fit older patients with secondary AML or therapy-related AML, liposomal daunorubicin and cytarabine improves OS and response rate compared with 7+3 with similar rates of AEs. For younger/fit patients without the above features, traditional 7+3 remains the standard upfront therapy. For newly diagnosed unfit patients, not eligible for intensive chemotherapy, hypomethylating agents remain the standard of care; however, several emerging therapeutics are currently in clinical trial testing utilizing novel targets. In the R/R setting, enasidenib now offers a non-cytotoxic option for patients with IDH2 mutations via its differentiating effect. Venetoclax targets BCL2 and is in late phase combination trials for patients not eligible for induction. Multikinase and specific, potent inhibitors of FLT3, including sorafenib, crenolanib, gilteritinib, and quizartinib, are also in late phase trials. Some may be best suited for adjunct upfront usage with chemotherapy like midostaurin, while others may have single-agent activity in the R/R setting. Adoptive cell therapy and antibody-based immunotherapy are novel approaches earlier in development that aim to improve antileukemia T cell function. Certainly, the AML landscape is now already dramatically changed and much promise awaits in the years to come. 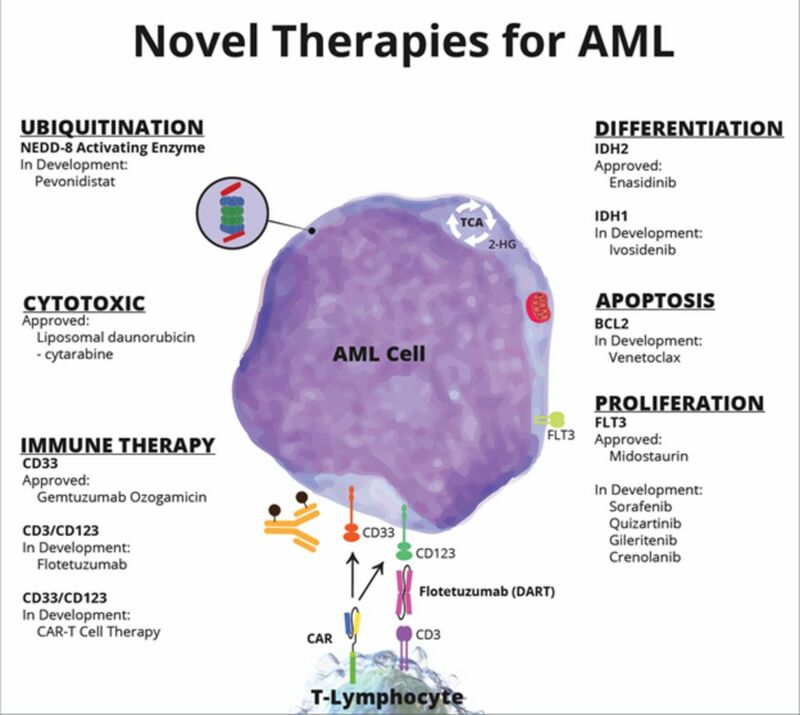 Novel AML targets and therapies. AML, acute myeloid leukaemia; BCL2, B cell lymphoma 2; CAR, chimeric antigen receptor; DART, dual-affinity re-targeting antibody; FLT3, fms like tyrosine kinase 3; IDH, isocitrate dehydrogenase.
. Safety and efficacy of venetoclax (ven) in combination with decitabine or azacitidine in treatment-naive, elderly patients (≥65 years) with acute myeloid leukemia (aml). Haematologica 2017:175–6.
. Updated safety and efficacy results of phase 1/2 study of venetoclax plus low-dose cytarabine in treatment-naive acute myeloid leukemia patients aged>= 65 years and unfit for standard induction therapy. Haematologica 2017:176.
. Quizartinib in acute myeloid leukemia. Clin Adv Hematol Oncol 2013;11:586–82013.
. nal results of a phase 2 open1label, monotherapy efficacy and safety study of quizartinib (AC220) in patients≥ 60 years of age with FLT3 ITD positive or negative relapsed/refractory acute myeloid leukemia. Am Soc Hematology 2012.
. Final results of a phase 2 open-label, monotherapy efficacy and safety study of quizartinib (ac220) in patients with flt3-itd positive or negative relapsed/refractory acute myeloid leukemia after second-line chemotherapy or hematopoietic stem cell transplantation. Am Soc Hematology 2012.
. Final results of the Chrysalis trial: a first-in-human phase 1/2 dose-escalation, dose-expansion study of gilteritinib (ASP2215) in patients with relapsed/refractory acute myeloid leukemia (R/R AML). Am Soc Hematology 2016.
. Results of a phase II study of crenolanib in relapsed/refractory acute myeloid leukemia patients (Pts) with activating FLT3 mutations. Am Soc Hematology 2014.
. Low relapse rate in younger patients≤ 60 years old with newly diagnosed flt3-mutated acute myeloid leukemia (aml) treated with crenolanib and cytarabine/anthracycline chemotherapy. Am Soc Hematology 2017.
. Ivosidenib (ag-120) in mutant idh1 aml and advanced hematologic malignancies: results of a phase 1 dose escalation and expansion study. Am Soc Hematology 2017.
. Azacitidine/decitabine synergism with the nedd8-activating enzyme inhibitor mln4924 in pre-clinical aml models. Am Soc Hematology 2011.
. Synergistic combination of MLN4924, an investigational small molecule inhibitor of NEDD8-activating enzyme (NAE), with azacitidine, a hypomethylating agent, in pre-clinical AML cancer models. Hematologica 2012;97:435.
. Results of a clinical study of pevonedistat (pev), a first-in-class NEDD8-activating enzyme (NAE) inhibitor, combined with azacitidine (aza) in older patients (pts) with acute myeloid leukemia (AML). Am Soc Hematology 2016.
. Preliminary results of a phase 1 study of flotetuzumab, a cd123 x cd3 bispecific dart® protein, in patients with relapsed/refractory acute myeloid leukemia and myelodysplastic syndrome. Am Soc Hematology 2017.
. The prognostic impact of BCL2 protein expression in acute myelogenous leukemia varies with cytogenetics. Clin Cancer Res 1999;5:1758–661999.
. High expression of bcl-2 protein in acute myeloid leukemia cells is associated with poor response to chemotherapy. Blood 1993;81:3091–61993. Contributors JRD and BAJ developed the review concept. All authors reviewed the literature, wrote and edited the manuscript and approved the final version. Funding BAJ received support by the National Institutes of Health National Cancer Institute (K12 CA138464-04). Competing interests BAJ is the consultant for Rigel, AbbVie, Amgen; advisory board member for Celgene; independent response review committee for Tolero; research funding to his institution from AbbVie, Daiichi Sankyo, Pharmacyclics, Genentech/Roche, Glycomimetics, Esanex, Kalobios, Incyte.